Republican Rep. Paul Ryan of Wisconsin, one of 12 sitting lawmakers on President Obama’s bipartisan fiscal commission, announced Thursday he would oppose the panel’s proposal when it is expected to come up for a final vote Friday. Ryan, the incoming chairman of the House Budget Committee, acknowledged to reporters at a Christian Science Monitor breakfast that he had “telegraphed” his decision during Wednesday’s commission meeting where the plan was unveiled. He called the commission a “success,” contending that it moved the debate about debt and deficits to an “adult level,” but said he ultimately could not support the package because it ignored the problems created by the new health care system. “It not only didn’t address the elephant in the room – health care – it expanded it,” Ryan said. The six-term Congressman said the American people were ready for lawmakers to deal with issues like Social Security in a serious way. “The third rail is not the third rail anymore,” Ryan said. He also praised the commission’s recommendations on tax rates and budget process reforms. 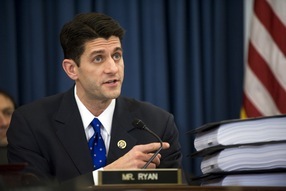 Ryan acknowledged that to solve the country’s fiscal woes it would require Republicans and Democrats working together. “No one party is going to fix this debt problem,” Ryan said.